There are many stories in the Bible that show what happens when you your faith and trust in God. Usually someone overcomes impossible odds, or does something seemingly bizarre to succeed. Of all the stories, there is one that sticks out to me. Every time I read it, I am pretty amazed at the faith of all the people involved. The story is found in 2 Chronicles 20, and is about King Jehoshaphat battle against the Moabites, Ammonites, and Meunites. The story goes that the three nations decided to invade Judah. Upon hearing this news, “Jehoshaphat was afraid and turned his attention to seek the Lord, and proclaimed a fast throughout all Judah.” (2 Chronicles 20:3, NASB). Jehoshaphat sought God’s help to prevail against the oncoming foes. He knew that their army was massive, and his was not, and it look as though everything was coming to an end for him and the people of Judah. God responds to the prayer of the people and their king by saying, “Do not fear or be dismayed because of this great multitude, for the battle is not yours by God’s. tomorrow go down against them. Behold they will come up by the ascent of Ziz, and you will find them at the end of the valley in front of the wilderness of Jeruel. You need not fight in this battle; station yourselves, stand and see the salvation of the Lord on your behalf, O Judah and Jerusalem.” (2 Chronicles 20:15-17, NASB). So Jehoshaphat marched the army to wear God had directed them, with choirs singing “Give thanks to the Lord, for His lovingkindness is everlasting” (2 Chronicles 20:21, NASB) leading the way. While they were praising and marching, the 3 armies turned on each other and killed themselves. When the Judean army came to the valley, all of their foes were dead. They then spent 3 days collecting the spoils of the “battle” an on the forth day they worshiped and thanked God for His provision. Can we trust our foundation this way? What would it look like if, when God tells us something, we listen. The people of Judah were told they would not have to fight, they simply had to listen. They trusted God to not give them up. We can trust God too. He knows what is best for us. When we build our house upon this foundation, we can find peace knowing that our best life is ahead of us. This doesn’t mean it will be easy. I think that is a very human understanding of what “best” is. We think that so long as we have $1,000,000 in the bank, we will be fine. But God never tells us that. In all honestly, when He was here on earth, He lived as a homeless man with nothing but the clothes on his body. Just because we have nothing, does not mean we are not living a good life. Trust in the Lord because He is our foundation, our rock, and our salvation. This weekend my church is starting some new programming. We’ve decided to do a one day vacation Bible School. Our theme for the day is going to be “Jesus is our Rock!” So I thought I would try to get into that subject this week. Today we are going to start with Jesus’ own words in Matthew. This passage comes at the end of the Sermon on the Mount. Jesus had spoken many great truths to the Jewish people in his message, and knew that it was now up to them to decide what to do with it. He wanted them to know that unlike many others (sometimes called false prophets), he, like God, doesn’t change. You can rely upon Jesus to stay the same no matter what is happening. The comparison of the wise and foolish man is to compare the two choices the people had with his teaching. They could either take it and live lives based on good, unchanging foundations. Or try something else, that is quite possibly going to fail. Jesus offers the same choice to you and me. He hasn’t changed in the last 2000 years, and he isn’t ever going to change. The Bible says, “Jesus Christ is the same yesterday and today and forever” (Hebrews 13:8, NASB). With someone who is that predictable and true, how could we not trust Him. I know that it gets hard. We have our own thoughts and opinions, and there are times that they contradict Jesus. I think this is where we have the hardest time trusting Him, because we say “This seems right to me”. Anytime I’ve ever followed my own opinion verses what Scripture says, I’ve always ended up wrong. 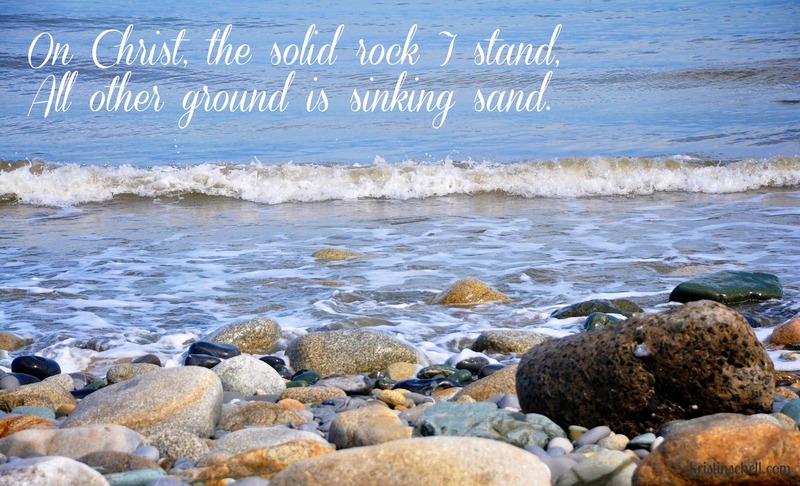 Jesus is our rock and firm foundation. When we build our lives upon Him, we won’t be disappointed. I’m reminded of what God says in Jeremiah,” For I know the plans that I have for you, plans for welfare and not for calamity to give you a future and a hope.” (Jeremiah 29:11, NASB). With plans like that for us, we should probably follow Him since we tends to lead ourselves away from welfare and hope. 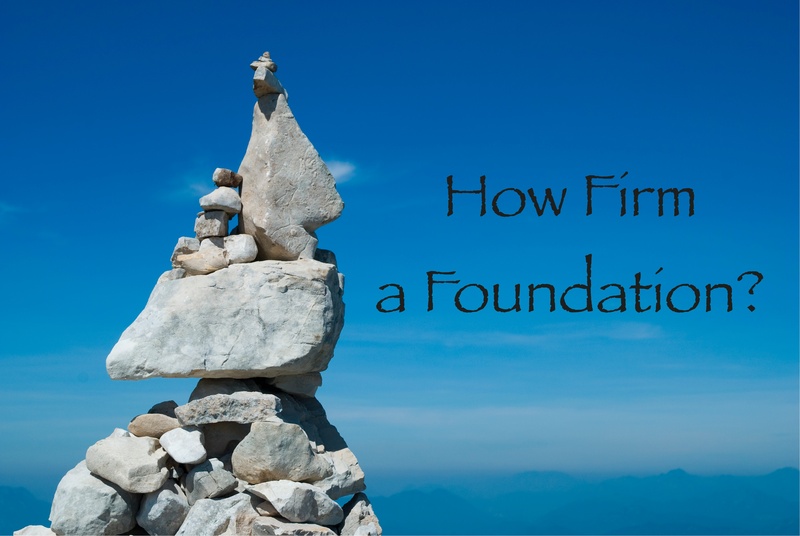 We will be looking at more ways God promises to be our firm foundation throughout the week. Let this song be our song for the week.